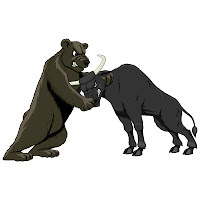 Bulls and bears go toe to toe - slight edge to the bears? Well, it seems like the markets are going nowhere fast. Major averages had nothing to show for the week's trading but fractional gains and losses. There was a limited news stream but what news we had ranged from neutral to positive. Weekly jobless claims ticked up but investors took comfort in the fact that the four-week average moved down. The Trade Deficit for October was released and it showed an increase in exports which supported sentiment on the manufacturing sector. Retail sales for November was quite a bit better than expected, providing hope the holiday shopping season would be profitable for retailers. The University of Michigan Consumer Sentiment Index advanced, as well. So economic fundamentals were again reasonably positive this week. How are things doing from a technical analysis point of view? This first chart presents our moving average analysis. The number of stocks above their 20-day moving average (not shown) and the number of stocks above their 50-day moving average both decreased slightly this week. Yet the number of stocks whose 20-day moving average is above their 50-day moving average actually increased slightly this week. Slight edge to the bears. Here we also see just a minor bit of negativity creeping into the chart. Number of stocks in strong up-trends declined slightly and number of stocks in strong down-trends increased ever so slightly. Again, slight edge to the bears. We have now experienced four full weeks in a trading range. Take a look at the chart below of the ETF that attempts to track the overall stock market. You can see that we have been stuck in a box for a while now. In addition, the Bollinger Bands on the major averages are starting to contract. This would seem to indicate that the market is getting ready for a big move -- eventually. With economic reports mostly positive these days, it's not unreasonable to think that the next move will be UP. With many technical indicators currently on the fence, for now, we play the waiting game. In the meantime, the bulls and bears continue to fight it out with neither obtaining the advantage. In the search for a catalyst, investors will have plenty to look at among this coming week's economic reports including the Producer Price Index (PPI), Empire State manufacturing index, Capacity Utilization, Industrial Production, Building Permits, Housing Starts, Consumer Price Index (CPI), more weekly initial jobless claims, the Conference Board's Leading Indicators Index and the Philadelphia Fed Business Outlook Index. The Fed will also release its policy statement. So the tug of war between bulls and bears is entering its fifth week. With the Fed, a raft of economic reports and the first stirrings of the next earnings season coming at us, we may finally see a resolution of this impasse.